Holy crap, you guys. I found my new favorite thing in the world, and it’s the limited edition Illuminating Powder Gelée in “Heat Wave” ($40) from the Estée Lauder 2013 Bronze Goddess collection. I’ve been anxiously awaiting the release of this highlighter, which happened on March 1st. I went to the mall on March 3rd, hoping to buy it before it sold out. I had this crazy vision that makeup releases worked the way music releases did back in the 90s – like they had this huge stockpile of the new makeup behind the counter just waiting for the official release date to go up for sale. There would be a huge line of frenzied people waiting to get their hands on it, and maybe they’d even do one of those number raffles to see what place you’d get in line. Well, guys. Turns out that’s not how it works. In fact, even though it had been a few days since its release, nobody had “Heat Wave” in stock yet. I hit up Macy’s first and they told me it was on its way, but bad weather was slowing down the shipment. I carried on to Belk, where the display stand was out but nothing was in it. When my friend Steven saw the empty display, he remarked that this is exactly what would happen in a stress dream about makeup shopping. Not to be defeated, I went home and ordered it from the Macy’s website, and by Monday I was finally holding it in my hands. When I opened the Illuminating Powder Gelée compact and saw the shimmering, beigey- gold powder inside, I actually sighed. The sun-like rays etched in the powder do a great job showing off this silky powder’s dimensions. In some light it appears to be more of a sparkling beige, and at other times it appears to be a straightforward gold. “Heat Wave” swatched next to Estée Lauder Bronze Goddess Bronzer in “Medium”. Because it’s a gelée, the texture is smooth, buttery, and easily blendable. Like Estée Lauder’s past gelées, the included applicator is an odd sponge tipped thing that I have yet to use. 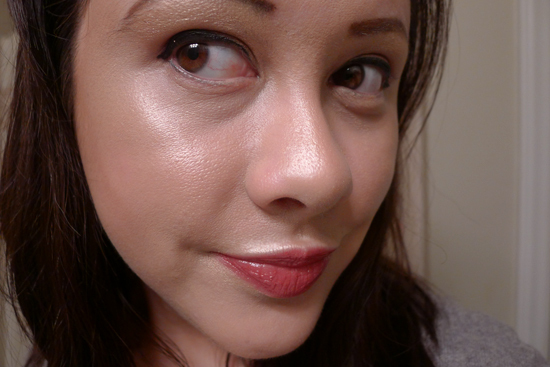 At first, I opted to apply this highlighter with a fan brush, which worked perfectly. 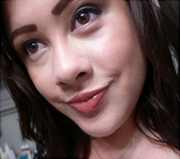 It allowed me evenly distribute the golden shimmer over the tops of my cheeks with a light hand. At some point though, I got too excited. This excitement inspired me to pull out a blush brush, and then I sort of intentionally lost control, layering obscene amounts of gold all over my face. It was very satisfying, but not how I’d recommend applying this highlighter if you’re going to be amongst other humans. 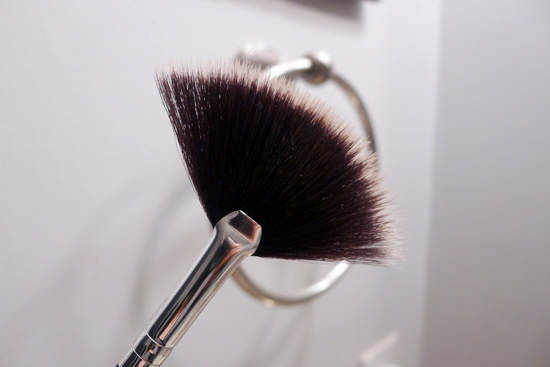 A fan brush is perfect for applying this Illuminating Powder Gelée. This is before I applied the highlighter. This is my face after applying the Illuminating Powder Gelée in Heat Wave with a fan brush, plus a little pop of the Exotic Orchid lipstick that came in my gift with purchase. The other side of my face. This is what happened after I ditched the fan brush for the and went bananas with a blush brush. Plus, more lipstick. Also, more bronzer. Satisfying, but not for going out in public. Stick with a fan brush. The highlight “Heat Wave” gives is extremely flattering. Some highlighters have tendency to increase pore visibility, but “Heat Wave” seems to blur out the appearance of pores. 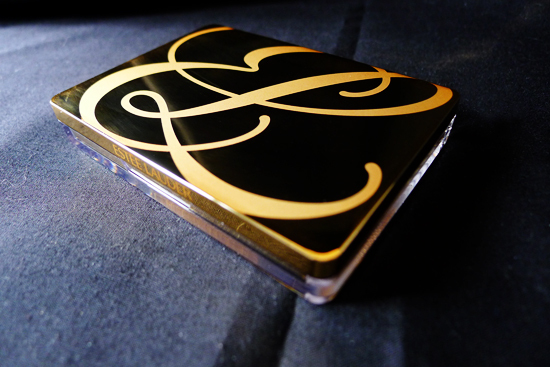 The golden shimmer is not glittery, gauche, or disco-esque. 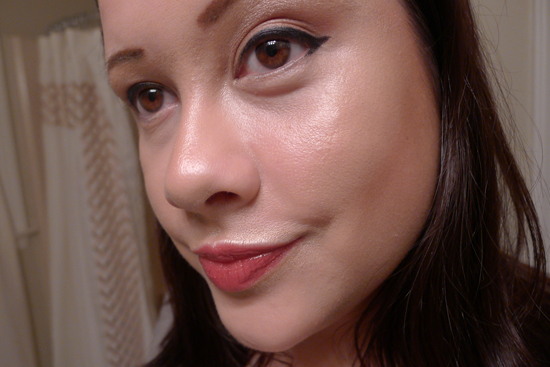 Instead, it’s a glowy, diffused shimmer that emulates dewy, youthful skin bathed in sunlight. This product would work for just about any skin tone. 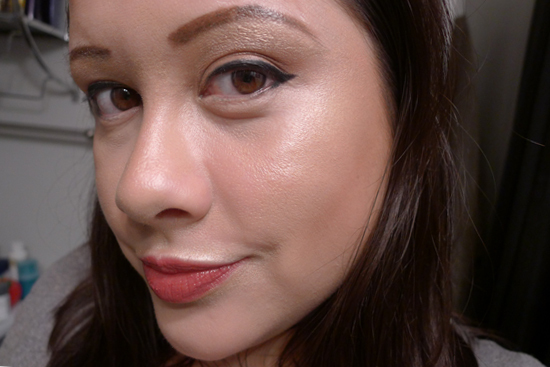 On fair-faced ladies, it will add a warm, subtle but noticeable highlight. On deeper skinned women, the dewy highlight will be more visible, and the soft gold hue will be extremely flattering. “Heat Wave” is an extremely versatile product – I dabbed a little in the cupid’s bow of my upper lip, and it perfectly defined my mouth shape. A light-handed swipe on top of under eye concealer provided an effect similar to Yves Saint Laurent’s Touche Éclat Radiant Touch luminizing pen, brightening the eye area. 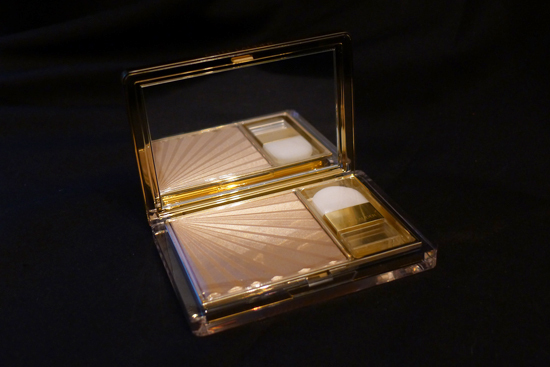 I’ve also been using this gelée as an eyeshadow – on the lids, it reads more gold than it does on the face, and the end result is fun and elegant. 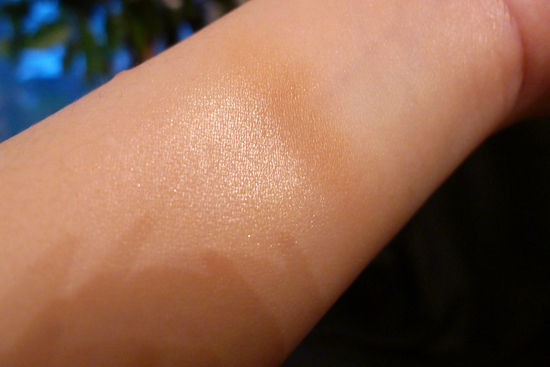 The lasting power of this Iluminating Powder Gelée is outstanding. I’ve worn it for as much as 8 hours without needing a touch-up. I suspect it would actually last a few hours longer, though I haven’t tested that theory yet. 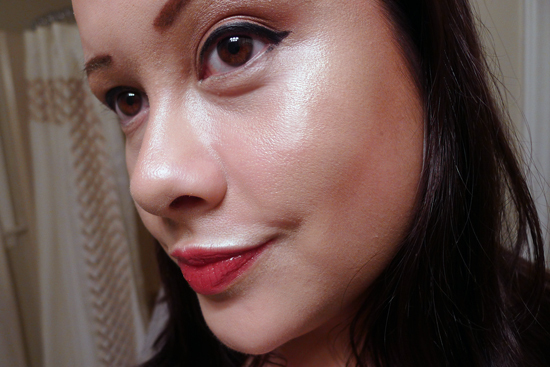 Illuminating Powder Gelée in Heat Wave has been my favorite makeup purchase of 2013 so far. 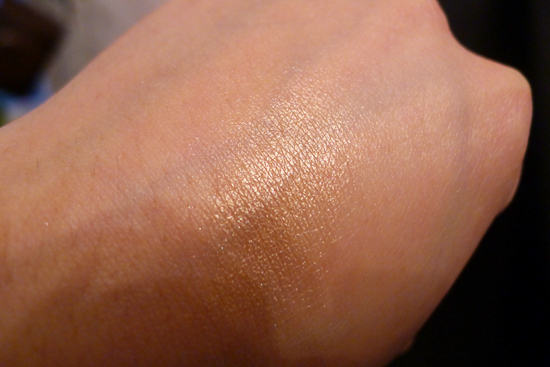 It’s also the first gold highlighter I’ve ever tried, and now that I have, I see a lot more of them in my future. 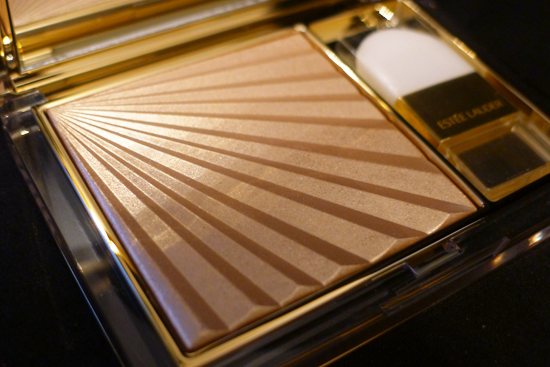 Illuminating Powder Gelée in Heat Wave is part of Estee Lauder’s 2013 Bronze Goddess collection. This means it’s limited edition, so if you’re thinking about picking it up, don’t wait too long. This gelée is available at most department stores, including Macy’s and Nordstrom, as well as the Estee Lauder website. This is the GWP that’s at Macy’s right now. I got mine online, but it’s also available in-store. Belk is doing a similar one at the end of the month. 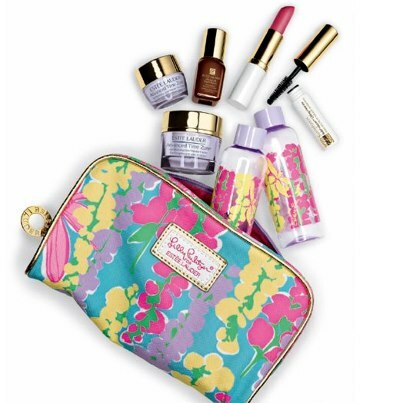 Right now, Macy’s is doing an Estee Lauder gift with purchase, so if you get this from Macy’s, in-store or online, you’ll also get a Lilly Pulitzer makeup bag filled with a full sized lipstick in your choice of a subtle or bold shade, a travel sized Advanced Night Repair serum, and a deluxe travel sized moisturizer and eye cream duo in your choice of Time Zone or Resilience Lift. The Macy’s gift with purchase only lasts for about 10 more days, but Belk is starting a similar gwp at the end of March. Value: 4/5 – At $40, it’s pricey highlighter, but it’s very high quality and there is enough powder in the compact to last a normal person a couple of years.